Anthony O'Toole with the Anthony O'Toole. Four Divisions out of six were won by Bilgola SLSC boat crews yesterday (Saturday 8th of November) in the opening round of the SLSSNB 2014-15 Boat Premiership, three of these crews with Don McManus as sweep while Benny Gill steered the Bilgola Bennys into first place in the Under 23 Mens. This was also the first carnival for Rick Millar sweeping for Manly with solid thirds by end of the racing yesterday. The Collaroy Krakens took out the Under 19’s division and Palm Beach Pearls triumphed in the Under 23 Women’s. Conditions for the opening Boat Carnival of this year’s Premiership brought a small swell with onshore winds. A drop in the middle of the sandbanks caused many boats already on a wave finding that wave disappearing beneath them and leads changed as a result. Shallow water in 1, 2, and 3 alleys as the tide dropped also brought their own challenges. At the end of the carnival guests and members of Bilgola Beach SLSC gathered to launch a brand new surfboat – the Anthony O’Toole, named for one great rower, with a long list of medals to his name, who has been a member at Bilgola since a Nipper and whose children and father are also Members – another multi-generation surf lifesaving family. Romilly Madew, President of Bilgola SLSC welcomed members and guests, thanking Member for Pittwater Rob Stokes, Mayor of Pittwater, Jacqueline Townsend, Councillor Bob Grace, Club sponsors Blackmore’s, represented by Caroline and Marcus Blackmore and Bilgola SLSC Patron John Brogden for attending the launch of a brand new surfboat. Bilgola’s President warmly thanked Graham Foran for organising the Bilgola SLSC’s surfboat carnival, and Boat Captain at Bilgola SLSC Norm Pounder for his fantastic work in creating boat crews at Bilgola. 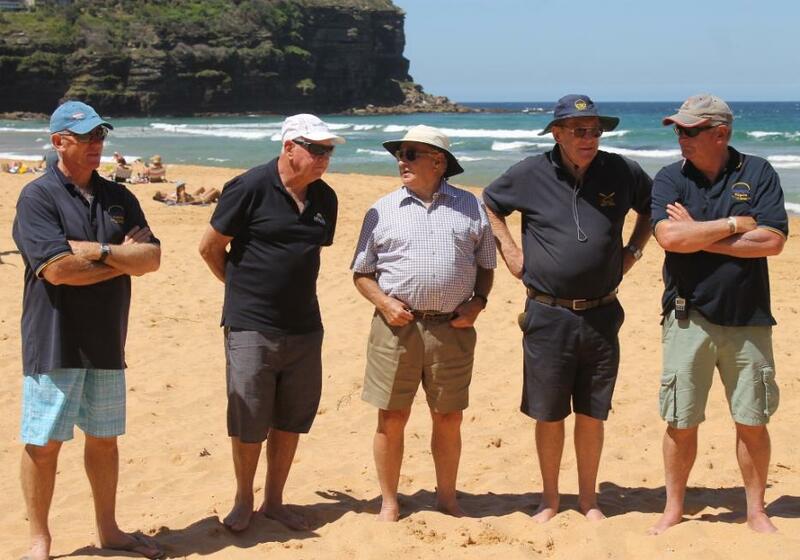 The Life Members of Bilgola Beach SLSC were thanked for manning the barbecue, no mean feat in yesterday’s heat. Romilly also thanked all boat crews and clubs that attended Round One, stating it was a fantastic turn out with onlookers treated to some spectacular rowing. Before telling those assembled about whom the new Blackmore’s Bilgola SLSC is named for, Romilly introduced Caroline Blackmore, who did her Bronze Medallion at Bilgola SLSC, to relate how this new boat came about. A few people have asked me today why we have given Bilgola SLSC a new boat as clearly they don’t need one with the results they achieved today. Well done to all the Bilgola SLSC crews for a fantastic performance. There are a lot of reasons we have donated this new boat, and some of them started a long time ago. 53 years ago I lived in a little house on Bilgola and I was born and raised on Bilgola Beach. My mum and dad were involved in the fundraising to build an extension in the pool in the late 1950’s and early 1960’s. Marcus and I come down here almost every day and walk on the beach or swim in the pool or ocean. We both love the Northern Beaches but when it comes right down to it, I think Bilgola Beach is the best beach here. But it’s not just the beach – it’s the club, and whether you’re a lifesaver, a rower or a Nipper, this is a fantastic group of people with fantastic volunteers and a lovely family atmosphere. We love it so much. Coming to how this new boat came about; we were walking our two dogs over at the dog park at Bayview one day, a day when it was pouring with rain, in which Bilgola was having a training day for the boat crews for new rowers. There was around 30-40 people of all ages having their first row on calm water, a lot of whom are here today having their first competitive row. Marcus asked, ‘Do you need a new boat?’, and of course they said ‘Yeah!’. We asked how much it would be, and the answer was ‘around 25 grand’, so we said, ok, we’ll get you a new boat – Romilly then called us on Monday to explain that it was actually 36 thousand – we went back to our company, Blackmore’s, and we decided to go halves. So this is not just a gift from Marcus and I, this is a gift from Blackmore’s and us. Thank you for the invitation to speak today and we hope you continue to do really well with your new boat. Romilly Madew thanked Caroline and Marcus and Blackmore’s for their incredibly generous gift and continued support of the Bilgola Beach SLSC, reminding everyone that our community volunteers and sponsors are what keep our Surf Clubs strong and patrols on our beaches. 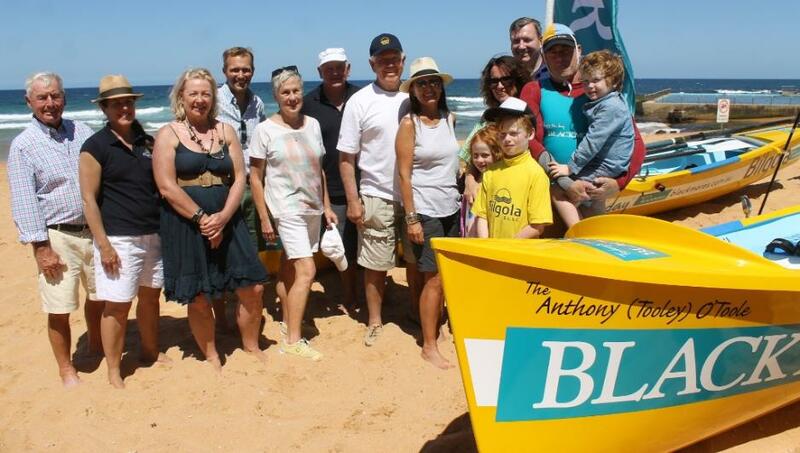 Norm Pounder, Boat Captain at Bilgola SLSC, echoed Romilly sentiments and then unveiled the name on the sleek and fleet Bilgola SLSC surfboat – the Anthony O’Toole! This is the first surfboat that a former Nipper has been named after and an abbreviated list of Anthony’s surf lifesaver record is below. ‘Ant’ is a member of the surf lifesaving crew that represented Australia last season in the Trans-Tasman series, which Australia consequently won 3 - nil. Anthony’s father is Dennis O’Toole, who is on the committee at Bilgola Beach SLSC, and a gentleman who has done much for surf lifesaving over many years. In March of this year Mr O’Toole (Snr. )worked hard to ensure the surfboat shootout racing event of the Pittwater Festival was a success. Ant’s children are also Bilgola Beach SLSC members – all Nippers, and are the third generation of O’Tooles to give their time, passion and energy to surf lifesaving. “Thanks to the club for naming a boat after me – it’s a real honour, but I’m a bit shocked and embarrassed,” he said, “We have a great club and there are lots of great people that the boat could have been named after so I am totally honoured and feel privileged to have been able to compete for Bilgola. I’d like to thank my parents and my family, for allowing me to row for so long, for putting up with all the training and going away to compete. At the end of the day it’s a fantastic sport – I’ve been all over Australia and have friends everywhere as a result, all the guys I’ve rowed with are my best mates, from Juniors right up until now. I’d like to thank the Blackmores for their ongoing support, we’re definitely one of the luckiest clubs in Australia due to your ongoing support – this is a great honour. Thank you." 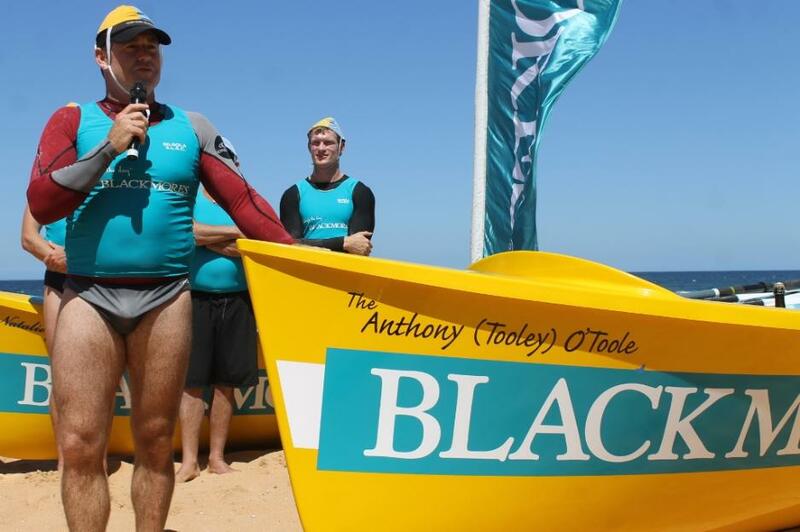 Anthony has served Bilgola SLSC in many ways. As a Plumber, he has performed lengthy labouring jours at the Surf Club, particularly when the Surf Club underwent major renovations in 2000-2001. He carried out the bulk of the Surf Club Plumbing during those renovations, for no labouring charges. Since those renovations he has regularly serviced the Surf Club when there has been a need for Plumbing services. For many years the Surf Club had a sewer blockage problem. Anthony regularly volunteered his services to attend to these problems, most being after hours when functions were in progress. He also carried out the Plumbing for the Caretaker room and Gymnasium renovations. * Anyone wanting a full sized photo from Pittwater Online News photo albums need to email us, with the number of the image you want please, here. NB: Pittwater Online News does not charge any $ for giving/emailing you photographs of you for you! Left to right: Pittwater Council Cr. Bob Grace, Romilly Madew, President of Bilgola SLSC, Mayor of Pittwater Cr. Jacqueline Townsend, Rob Stokes MP for Pittwater, Mrs and Mr Dennis O'Toole, Marcus and Caroline Blackmore, Mrs and Mrs Anthony O'Toole and their children with Bilgola SLSClub Patron John Brogden. Report and Pictures by A J Guesdon, 2014.